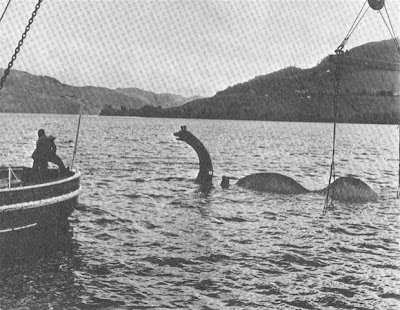 It only took about 47 years, but the famous two humped monster created for the film "The Private Life of Sherlock Holmes" has finally been found using sonar. News story here. Once suggested as the identity of the 1975 underwater "gargoyle" picture, this was another monster that eluded hunters for decades. But a tourist unwittingly photographed it when it was undergoing trials, I wrote on that here. I would be curious to know at what depth the prop was found out and whether a ROV may be sent down to get conclusive photographs? The sonar device employed was a Kongsberg MUNIN AUV (Autonomous Underwater Vehicle) which does have a still camera capability. So we may yet see some optical images, though it is not clear how functional such a device would be in the loch's dark, peat stained depths. Further details on this hi-tech sonar device can be found here as well as their take on this news. In terms of the task of exploring larger areas of the loch with the AUV, we can see what area was swept during the search for the prop in the two images below. The small circle denotes the location and extent of the sweep in relation to the loch size and the actual area in the zoomed second image. The monster prop is located at the centre of the sweep. How much the object has silted up over those decades is also interesting in relation to finding real carcasses at those depths. I note with interest that previous big publicity sonar sweeps of the loch which claimed to have found no traces of large objects managed to miss this one. Perhaps they were looking in the wrong place or were not sensitive enough? Whatever the reasons, we have a new survey ongoing as part of the Loch Ness Project's "Operation Groundtruth". I am ambivalent on what is to be found in terms of monster carcasses. How many such carcasses lie on the bottom of the loch? How buried are they in silt? Have most of the bones mainly dissolved away (more likely for cartilaginous bones)? That does not mean we should not look, so I wish Adrian luck in tracking down anything of a more monstrous nature. POSTSCRIPT: As an addenda, I heard Adrian Shine stating on an American broadcast that this was a known sonar anomaly. So, the implication is that conventional sonar had detected something of note, but it was not good enough to resolve the image into something identifiable. I suspect there are a good number of such contacts which lack enough definition and require better technology to resolve them.